We have a collection of books on display in the Atrium of the Library which show some of our Rare Books and in particular the beautiful bookplates inside. We have found that we have bookplates in our collection designed by William Blake and Hermann Struck (who drew Albert Einstein and Oscar Wilde) and that Portsmouth Polytechnic had its own bookplate for the architectural books that form the Bolton Collection. On show, we have some of the simple and beautiful bookplates that we have discovered so far. Many of us don’t collect books or keep them for as long as people in the past did, so we don’t use bookplates so much anymore. Opening one of these old books and finding beautiful art inside the front cover, feels like discovering treasure and opens a light on the past. 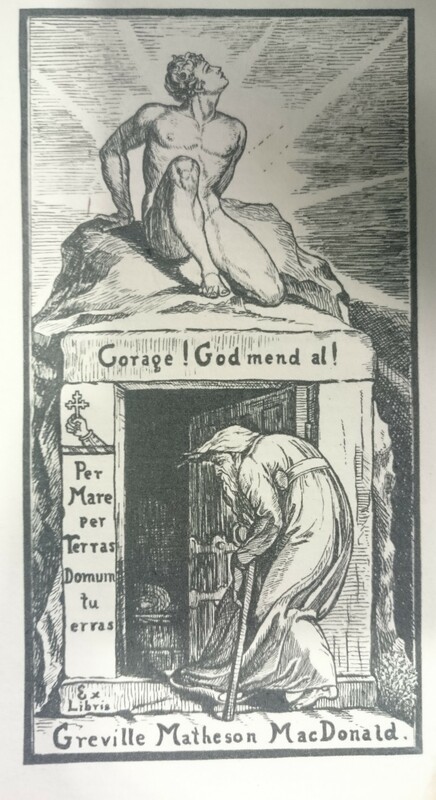 Bookplate designed by William Blake .The motto ‘Gorage! God mend al’ is an anagram of Grevilles father’s name – George Macdonald who was a Scottish author and poet. Bookplates first appeared in the 15th Century in the libraries of nobility, the gentry and professional men to state ownership of books. The earliest ones were simple designs from a woodcut print, but they then developed into heraldic themes representing the family name with a coat of arms. The use of engraving in the 17th century meant the designs became more complicated and often included a motto. The early 18th century the designs were larger and more elaborate incorporating mermaids, shells and mythical creatures on a detailed background. Later in the century, they became even more pictorial and often featured elements of the owner’s occupation. Other design features were household imagery – inkwells, books and elements of furniture design. By the late 19th century bookplates could be found in many households and were personally designed to reflected movements in art like Art Nouveau and were often illustrative, included themes of fantasy, nature and animals. Into the 20th century, designs are simple, bold and used colour in their designs. If you would like to come and see the books they will be on display in the glass display cupboard in Library Atrium until the end of November after which they will return to the darkness of the Rare Books Room. Enjoy them while you can!